Source: Alcott L. M. (1868). Little Women.Boston, MA: Roberts Brothers. With their father away at war, Meg, Jo, Beth, and Amy make plans for Christmas. A letter from their father arrives. The girls awake Christmas morning to find gifts from their mother, and decide to help out a less fortunate family. Jo and Meg decision to attend a New Year's Eve party causes quite a commotion. A good deal of Meg, Jo, Beth, and Amy's personalities are divulged to the reader. Jo pays a visit to Laurie. The Meg, Jo, Amy, and a reluctant Beth pay a visit to Mr. Laurence's home. Amy's difficulties at school lead Ms. March to take action. Jo's refusal to invite Amy has unintended consequences. A near tragedy brings the sisters back together. Meg's stay with the Moffats introduces her to the life of a young lady. The secretive Pickwick Club is disclosed to the reader. The girls decide to experiment with laziness. Laurence invites the girls to go camping. The children discuss their dreams. Laurie and Meg argue about the future. Jo runs into Laurie and the two trade secrets. Mrs. March departs after receiving word of Mr. March's health. Jo makes a sacrifice to provide for the family. The girls each write a letter to their mother. Beth's visit to the Hummel family has unintended consequences. Mrs. March is sent for as Beth's condition worsens. Amy's interaction with Esther leads her to write her will. Mrs. March returns and visits Amy. Mr. Brooke's intentions towards Meg are disclosed. Laurie's prank on Meg angers the girls. Jo talks to Mr. Laurence in order to restore peace. Mr. March arrives just in time for Christmas Day. Mr. Brooke pays a visit to the Marches to make a request of Meg. Three years have passed and Mr. March has come home. Meg is preparing for her marriage, while Jo pursues a writing career. At a small ceremony, Meg marries Mr. Brooke. Amy's luncheon with her art class goes badly. Jo starts to sell her stories to provide for the family. Meg discovers that married life is not as easy as she thought. Amy and Jo exhibit their personality differences while visiting several families. Mrs. Chester's fair allows the girls to show off their individual talents. Aunt Carrol's decision leaves Jo dissapointed. While in Europe Amy runs into Fred Vaughn, an old acquaintance from Camp Laurence. Amy continues to write letters to her mother and sisters. Jo, intending to help her sister's relationship with Laurie as well as her own writing, decides to move to New York. Jo, now in New York, writes her family to tell them of her experiences. Joe continues to write, but decides not to write sensational stories anymore. As summer arrives, Jo returns home to her sisters and mother. Jo's return home leaves Laurie with a broken heart. Beth divulges a secret to Jo concerning her health. On Christmas Day, an older Laurie and Amy rediscover each other. Meg and John's marriage experiences another crisis. Marmee's advice yields positive results for Meg and John. Amy, realizing that Laurie is heart broken, gently reprimands Laurie for his behavior. Beth's room is prepared to make her final days as comfortable as possible. Jo's poem has a profound effect on Beth. Amy, having learned of Beth's passing, is joined by Laurie in Europe. Jo is deeply affected by Beth's passing, and begins to reminisce about her time in New York with Professor Bhaer. Laurie and Amy return home with some surprising news. Professor Bhear, in town on business, pays a visit to Jo. Laurie and Amy discuss their plans for the future. The reader is introduced to Meg and John's twins. Jo and Professor Bhear divulge their true feelings to one another. After the sudden death of Aunt March, Joe and the Professor inherit Plumfield. The novel closes as Mrs. March celebrates her sixtieth birthday surrounded by her daughters and extended family. Alcott, Louisa May. Little Women. Lit2Go Edition. 1868. Web. <https://etc.usf.edu/lit2go/36/little-women/>. April 19, 2019. 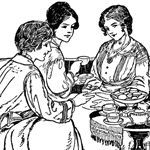 Louisa May Alcott, Little Women, Li2Go edition, (1868), accessed April 19, 2019, https://etc.usf.edu/lit2go/36/little-women/.